Home Children's Ministry Eat Chicken! How do you know if someone is a fit for marriage? If they are willing to be the rear end of a cow with you! 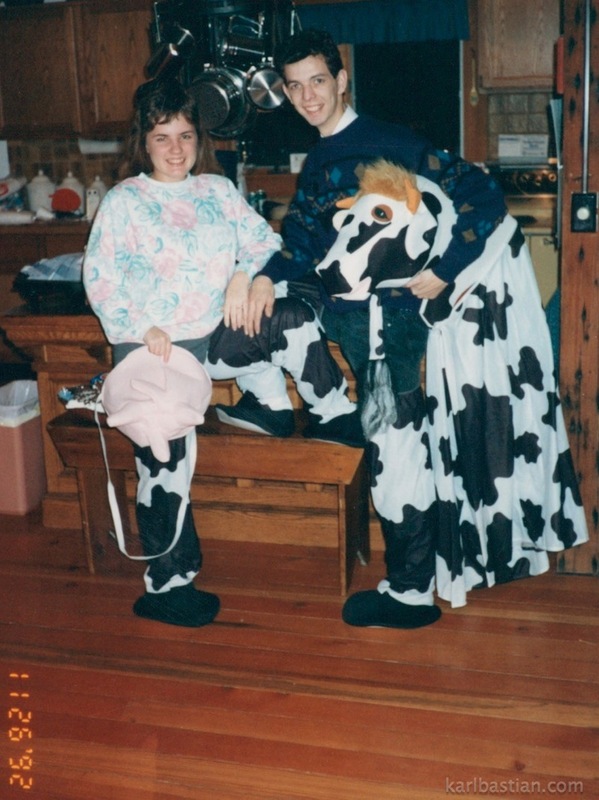 This is Sara and me practicing in my Cow Costume (which I still have 20 years later!) eight months before we were married. I got it for a Christmas Play where Hark, from the Herald, traveled through time to interview different characters from the Christmas Story (shepherds, wise men, innkeeper, etc.) in order to discover the “True Meaning of Christmas.” However, I thought it was too sacrilegious to have “Hark” interview Mary or Joseph in the Nativity, so I had him interview a cow off to the side instead. I was very excited when I got my two-man, er, one man – one fiance cow costume, and Sara was happy to help me figure it out and practice with it while were on a Thanksgiving retreat with my family that winter. Cow or no cow, we’ve made quite a team over the last twenty years!